The banking industry is poised for disruptions. Technology is changing banking like never before. The evolution of mobile payment systems, online purchasing, peer to peer lending platforms and several other Financial Tech start-ups are creating a revolution in the banking industry. The banks are under immense pressure from technology companies, global financial crisis and looking at ways to bolster their performance. Consumers are on the lookout for more convenient ways for transactions with mobile banking and digitalisation. Banks have to proactively seize the opportunities before it is too late for them. The digital world is changing things & making lot of industries obsolete. Uber is now the world’s largest taxi company, but doesn’t own any vehicles. Airbnb provides accommodation without owning any hotels, ecommerce companies like Amazon, Alibaba are now among the world’s most valuable retailers, they don’t own any inventory. These companies have evolved with technology. They provide platforms which connect them to users. The banking industry is also seeing a rise of these platforms. For e.g. Lending platforms are created for facilitating loans to people electronically. These platforms don’t own bank branches and other costs which a traditional set-up incurs. Yet, they are directly interfaced with customers & make money. Internet of things is an interconnected ecosystem of people, processes and technology. It facilitates mobile banking and connects all the consumers to a centrally connected interface. The consumers can be tracked from the centralised system. It also makes all processes like loan repayments, mobile payment transfer and other transactions easy. Banks all over the world suffer from bad loans. To minimise the losses, the collaterals act as a security measure for these banks. The process for collateral verification can be automated with GPS enabled IoT. These locations of the collaterals can be marked against the loans. If the collaterals cannot be located or verified, then the alerts can be sent to concerned authorities. The vehicles, properties and other types of loans can be marked on the GPS enabled IoT maps. The centralised system can be used to depict the bad loans according to locations, the outstanding amount, the loan repayment revenue etc. With a centralised system all information related to borrower’s location, collateral details, documentation & personal details can be viewed in the system. 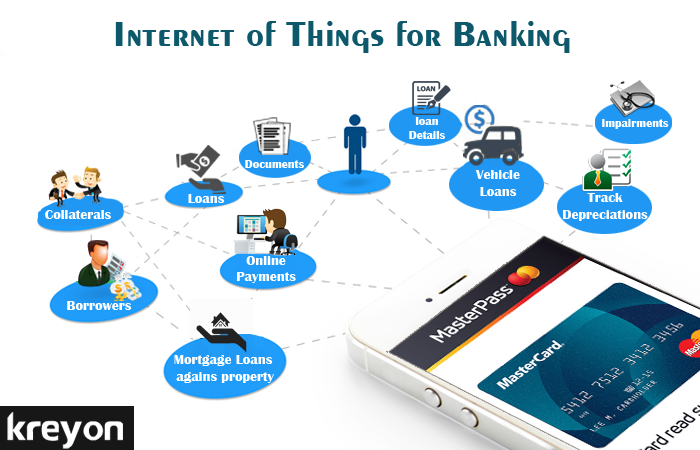 The IoT also enables key alerts and triggers for repayments of loans, documentation updates and other events. The valuation of a collateral property can be done with IoT enabled valuation system. The property to be valued is marked on the map. The maps also have indices for calculation of the real value of the property according to land area, location, and other conditions. A automated valuation system correctly determines the true value of property. This valuation system is integrated to the loan management process. GPS enabled maps with realtime indices and calculation systems are used for calculating the valuation of the properties and other types of assets. When a consumer is connected to the centralised system, he receives detailed information on loan repayments, effective interest rates, outstanding loan amount etc. The consumer or the borrower is notified all key events in the system. The banks can also use GPS location of the borrower and other collaterals submitted for loans. Banks are often at a loss when the outstanding loan amount becomes less than the value of collaterals submitted by the borrower. With Internet of things enabled system, the value of collaterals is automatically calculated based on depreciations and impairments. Whenever the outstanding loan amount is greater than the value of collaterals, a notification is issued to concerned authorities. These measures reduce the chances of bad loans. The location based analytics are used by the bank for proactive decision making. The list of all borrowers, their contact details & summarised loan summary is available to the bank. The maps display the graphical information and analytics related to loans. For e.g. total amount of loan disbursed by the bank in a particular location, loan repayments, outstanding loan amount and defaulter ratio etc can be tracked on the GPS enabled systems. This is also used for predictive assessments and evaluation of loans. Banks can leverage location based & contextual data for sending out product alerts to consumers. These marketing messages can be delivered according to the user behavioural patterns. This data is collected through apps installed on the consumer devices. The internet of things enables detailed insights into what customers want and helps organisations to tailor their marketing messages accordingly. The mobile payment systems with biometric, voice or facial recognition for payments are making transactions easier. These payment systems are connected to centralised system and make things seamless and efficient for the consumers. for the banking industry. The data is collected, stored and mined for predictive insights. Whether it is the risk assessment of a new loan or an electronic payment system, IoT systems will be at the forefront to empower consumers. Banks will be able to capitalise on IoT to improve their agility, simplify processes, and deliver true value for the consumer.